Replace a CA-signed certificate from one certificate authority with a CA-signed certificate from another. Replace a self-signed certificate with a CA-signed certificate. Replace one type of CA-signed certificate with another type of CA-signed certificate from the same certificate authority. If you need to renew an existing CA-signed certificate from the same CA, see Renew an Expired Certificate for the Privileged Remote Access Appliance. BeyondTrust client software must be able to validate the SSL certificate of their appliance in order to establish secure connections. To do this, they must trust the certificate authority of the appliance's server certificate. If this CA is changed without preparing the clients beforehand, then it is possible to permanently lose connectivity to the clients due to failed SSL validation. To avoid this, the BeyondTrust Appliance must be properly updated with product builds from BeyondTrust Technical Support and provisioned with the new CA-signed certificate. When using a CA issuer other than Let's Encrypt, the first step is to create the CSR. The request data associated with the CSR contains the details about your organization and BeyondTrust site. This request data is submitted to your certificate authority for them to publicly certify your organization and BeyondTrust Appliance. GoDaddy SSL (www.godaddy.com/web-security/ssl-certificate) - GoDaddy is the world's largest domain name registrar, and their SSL certificates are widely used. 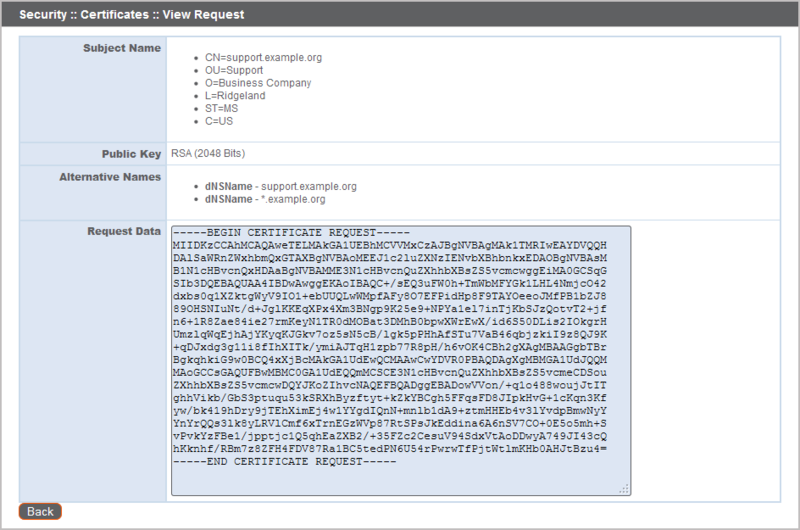 When prompted to submit the request information, log into the /appliance interface of your BeyondTrust Appliance. Go to Security > Certificates. Select and copy the Request Data, and then submit this information to your certificate authority. Some certificate authorities require you to specify the type of server the certificate is for. If this is a required field, submit that the server is Apache-compatible. If given more than one Apache type as options, select Apache/ModSSL or Apache (Linux). Once you have downloaded all the certificate files for your certificate chain, you must import these files to your BeyondTrust Appliance. Log into the /appliance interface of your BeyondTrust Appliance. Go to Security > Certificates. The BeyondTrust server certificate has an Issued To field and/or an Alternative Name(s) field matching the BeyondTrust Appliance's URL (e.g., access.example.com). To insure the reliability of your client software, BeyondTrust Technical Support builds your root certificate into your software. Therefore, any time you import a new root certificate to your BeyondTrust Appliance, you must send to BeyondTrust Technical Support a copy of the new SSL certificate and also a screenshot of your Status > Basics page to identify the appliance being updated. Do NOT send your private key file (which ends in .p12) to BeyondTrust Technical Support. This key is private because it allows the owner to authenticate your BeyondTrust Appliance's identity. Ensure that the private key and its passphrase are kept in a secure, well-documented location on your private network. If this key is ever exposed to the public (via email, for instance), the security of your appliance is compromised. At this point, the appliance should be fully upgraded and operational with its new certificate. The old certificate may be removed and/or revoked as necessary.